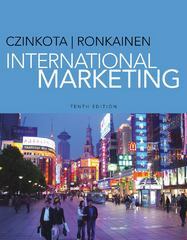 International Marketing 10 Edition INTERNATIONAL MARKETING is an innovative, up-to-date text ideal for anyone seeking success in this fast-paced field. You will discover topics ranging from beginning start-up operations to confronting giant global marketers. This in-depth text will prepare you to conquer the international business world!